We never like to leave our guests hungry or thirsty. So from the hearty breakfast buffet (cooked and continental) to the 24hr bar and café, we'll set you up with snacks and drinks whenever you need them. If you're lucky enough to be with us during nice weather, our bar's terrace is a pleasant place to kick back with a drink and good company. And don't forget, we're one of the few hotel chains that are happy to welcome pets as well as their owners, so bring them along for moorland walks and seaside fun! The hotel is perfectly located for easy access to the A38 and the shopping and entertainment districts of Plymouth. 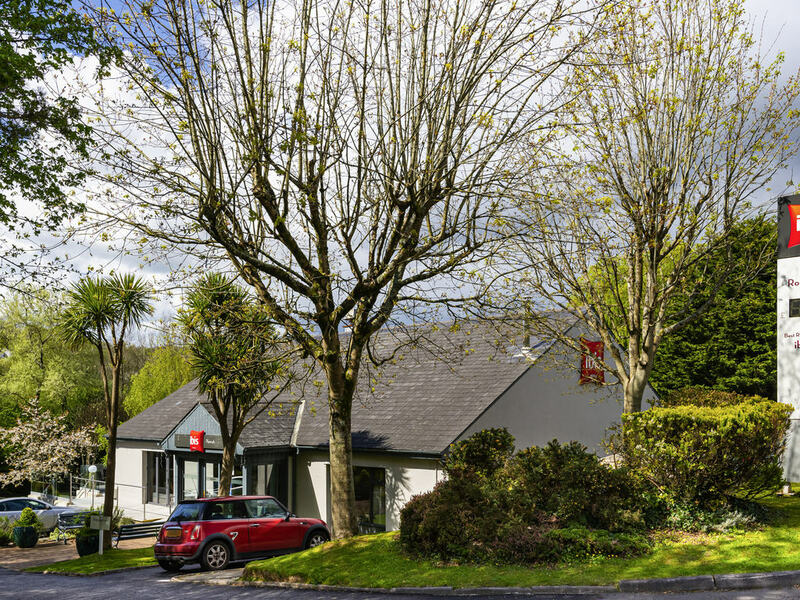 Plymouth train station is 5km from the hotel, while Plymouth Airport is also 5km away Away from the hustle and bustle of the city, chalet-style ibis Plymouth is home to 52 guest bedrooms which open directly to the outside. All rooms feature Sweet Beds and en suite power showers for a restful, restorative stay at budget-friendly prices. Around 10 minutes' drive from the centre, our quiet spot offers easy access to Dartmoor National Park and the beautiful beaches of south Devon. By car, Cornwall lies just over the River Tamar, perfect for exploring dramatic coastline with a pasty in hand. Free on-site car parking. Payable for lorries ,coaches and large vehicules. Despite the overall rather tatty appearance of the hotel from the outside, once in the room, everything needed for a good nights sleep was there. The bed was so comfortable and the pillows were soft. Lovely, big white towels were there to dry oneself. All facilities worked well. Location good quiet for us. Friendly and helpful staffs, Room was good and clean. Public transport we are got off near the hotel. Arrived after a long houeneyband was made extremely welcome . The staff were very kind and got me a meal and room sorted out really quickly. A very pleasant stay, extremely good value for money. The hotel is quite old, built in the style of the traditional motel and my room would benefit from redecorating, but, it was very clean, and contained everything needed for a pleasant stay. The bed was comfortable and room was warm. The staff where excellent, welcoming and helpful throughout the stay. Breakfast was great, plenty of choice, both hot and cold, very good value. There is some road noise, which given the that the A38 is adjacent has to be expected, but wasn’t detrimental to my stay. All in all an excellent little hotel which I would highly recommend. From checking in on the first afternoon to leaving after 3 nights everything about our stay was smooth and easy. Fantastic stay. Rooms are old in style but the newly renovated room looks exceptional. Staff are all amazing, can not fault anyone, so friendly and helpful. Breakfast was filling and hearty. Will certainly stay here again and hopefully get to try the new rooms. Paid for a double but swapped to a twin. I forgot how small a single bed was. Slight issue with charging side of things. I booked on behalf of my staff online and I paid online using my stored business card details or so I thought. I hadn't paid, but merely booked and my guys were asked to present my business card which of course they couldn't. Was sorted in the end, but I missed the fact that payment was not made at time of booking. Perhaps could have been made more clear at time of booking online. Staff and breakfast were very good, accommodation is a cross between run down American hiway motel and a holiday chalet from a bygone era. Clean and tidy. Rooms in desperate need of modernisation. Damp feeling in the rooms also. Over priced for the area considering its location and the standard of accommodation on offer elsewhere for a lower price.